Located right across the Santa Eulália beach in Algarve’s Albufeira, Grande Real Santa Eulália Resort & Hotel Spa is a 5-star hotel that guarantees extraordinary holiday experiences. With 344 plush rooms and suites and 155 holiday apartments, this beach hotel is ideal for family holidays. 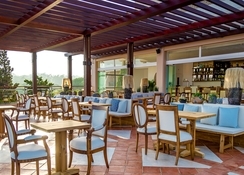 The hotel has 5 exquisite restaurants that serve a wide array of menus from various cuisines, 2 on-site bars serving drinks of all kinds and a spa that offers rejuvenating massage treatments and therapies. For its younger guests, Grande Real Santa Eulalia Resort has got a kids’ club and 3 paddle pools. The 4 outdoor swimming pools for adults are the perfect spot to lounge during the day or take a relaxing dip. The evenings are lit up by in-house and celebrity DJs at the disco. The hotel also has a self-catering unit where you can prepare your own food. For those driving down to the hotel, there’s free outdoor parking and subterranean garages. 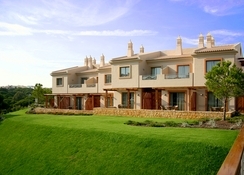 Grande Real Santa Eulália Resort & Hotel Spa in Albufeira, Algarve is located at a distance of 30 km from Faro. The resort’s close proximity to city’s historic centre and 3 different beaches helps its guests to enjoy cultural day outs and leisurely evenings by the shore. There are 155 holiday apartments and 344 rooms, out of which 29 are suites. The interiors at Grande Real Santa Eulália Resort & Hotel Spa are designed by renowned Portuguese interior designer, Graça Viterbo. Every room is designed to offer its guests with enchanting views of Santa Eulália beach and the resort’s garden areas. The rooms are fitted with satellite TV, air conditioning, telephone, Wi-Fi, minibar, safe and have a private balcony for their occupants. The apartments feature a living room, a bedroom and a kitchenette. 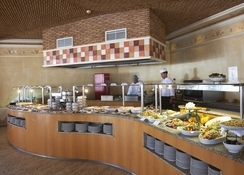 The 5 on-site restaurants at the resort serve a great range of Portuguese and international cuisines. The Real Cozinha Restaurant come with a terrace and direct access to the swimming pool, Santa Eulália Restaurant is great for Portuguese food, Pérgula Restaurant serves gourmet burgers and Atlântico Restaurant Bar is perfect for a quite dinner with views across the Santa Eulália beach. Additionally, there is a self-catering unit where you can prepare your food. There are 2 bars to add to the bliss with cocktails and tapas. With 17 treatment rooms, Thalassotherapy Circuit, relaxation areas, sauna, hammam and gym, the Real Spa at The Grande Real Santa Eulália Resort & Hotel Spa offers its guests a relaxing holiday. Younger guests at the resort can find music, games and entertainment according to their taste and age. The Realito Kids Club organises activities for children between the ages of 3 and 12. 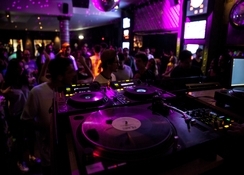 Le Club Disco adds to the nightlife at the resort with regular celebrity DJ performances. I took my Mum on holiday as a gift for her 75th birthday. We had a fabulous time. Staff were so lovely. Hotel room was very spacious and comfortable. We even had room service, that was lovely. Food was very good. 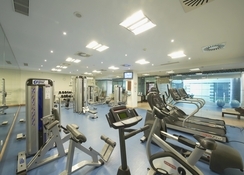 Superb location and facilities. We had a self-catering apartment which offered everything we needed. If we went again (which we probably will), we would request an apartment with better outlook over the small pool. Immaculately clean with great access to the beach. Only negative, hotel restaurant prices very expensive by Portuguese standards, but lots of good restaurants around within walking distance. Hourly free bus service into Albufeira 10 minute ride away. Frequent public bus service right outside gates for longer trips along Algarve coast. Fabulous place to stay. The only fault is that they advertised an indoor pool but the catch was a a20 euro fee for one hour as it was a thalassic pool. It was too cold when we stayed to use heated outdoor pool although they looked lovely and clean. Other than that excellent break. It's Grande in both senses.